Do you want the taste of Buffalo Wings, but dread the mess that it causes on your hands, mouth, and wherever else it drops? Then this is a recipe that you must try! 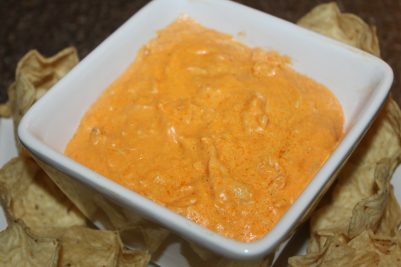 This dip gives you the flavor of buffalo chicken wings, but in an easy dip form. For your low-carb fans, it goes great with celery sticks. And of course, for your traditional Superbowl snackers – serve with tortilla chips or crackers! The best part is how easy it is to prepare – just throw all the ingredients in a crockpot – and it is ready to eat whenever you are! If you have the time, I would definitely use a rotisserie chicken. Don’t stop reading here – you can always use canned chicken – but it is so easy to stop at a grocery store, pick up a cooked rotisserie chicken. It is simple to shred, and to be quite honest, it actually costs less than the two or three cans of canned chicken that you will buy. As for the sauce, try and stick to a cayenne based sauce. Don’t worry about the heat index – with the addition of the cream cheese, the sauce mellows out while it cooks. In fact, Jim and I tend to add a few sprinkles of our ground cayenne pepper for extra heat to our individual servings. But, we like it hot! 1. 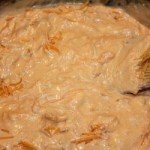 Place the chicken, ranch dressing, hot sauce and celery in the crockpot. Mix together. 2. Roughly cut your cream cheese into large cubes and place on top of the mixture. 3. Cook on high for about an hour – stir in the melted cream cheese. 4. Reduce heat to low. Continue to cook and stir occasionally. 5. Immediately before serving, add in the shredded cheese. 6. Serve with celery sticks, peppers, crackers, tortilla chips, etc…. Place the chicken, ranch dressing, hot sauce and celery in the crockpot. Mix together. Roughly cut your cream cheese into large cubes and place on top of the mixture. Cook on high for about an hour - stir in the melted cream cheese. Reduce heat to low. Continue to cook and stir occasionally. Immediately before serving, add in the shredded cheese. ← Simple Tips To Building Great Garden Soil…Naturally!